Courtesy of the publisher Little, Brown and Company and USA Today, you can read an excerpt from “The Silkworm,” the upcoming mystery novel from Robert Galbraith. 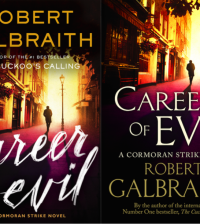 Note: Galbraith is actually J.K. Rowling of Harry Potter fame. She first published under the Galbraith pen name with “The Cuckoo’s Calling” which went on to be a best-seller. “The Silkworm” goes on sale on June 19. What dost thou feed on? The large unshaven man tramping through the darkness of predawn, with his telephone clamped to his ear, grinned. “How d’you know where I live?” demanded the voice. A groan. Strike could hear the rustling of sheets. “Smithfield Café on Long Lane,” said Strike and rang off. The slight unevenness in his gait became more pronounced as he walked down the slope towards Smithfield Market, monolithic in the winter darkness, a vast rectangular Victorian temple to meat, where from four every weekday morning animal flesh was unloaded, as it had been for centuries past, cut, parceled and sold to butchers and restaurants across London. Strike could hear voices through the gloom, shouted instructions and the growl and beep of reversing lorries unloading the carcasses. As he entered Long Lane, he became merely one among many heavily muffled men moving purposefully about their Monday-morning business. A huddle of couriers in fluorescent jackets cupped mugs of tea in their gloved hands beneath a stone griffin standing sentinel on the corner of the market building. Across the road, glowing like an open fireplace against the surrounding darkness, was the Smithfield Café, open twenty-four hours a day, a cupboard-sized cache of warmth and greasy food. The café had no bathroom, but an arrangement with the bookies a few doors along. Ladbrokes would not open for another three hours, so Strike made a detour down a side alley and in a dark doorway relieved himself of a bladder bulging with weak coffee drunk in the course of a night’s work. Exhausted and hungry, he turned at last, with the pleasure that only a man who has pushed himself past his physical limits can ever experience, into the fat-laden atmosphere of frying eggs and bacon. Two men in fleeces and waterproofs had just vacated a table. Strike maneuvered his bulk into the small space and sank, with a grunt of satisfaction, onto the hard wood and steel chair. Almost before he asked, the Italian owner placed tea in front of him in a tall white mug, which came with triangles of white buttered bread. Within five minutes a full English breakfast lay before him on a large oval plate. Strike blended well with the strong men banging their way in and out of the café. He was large and dark, with dense, short, curly hair that had receded a little from the high, domed forehead that topped a boxer’s broad nose and thick, surly brows. His jaw was grimy with stubble and bruise-colored shadows enlarged his dark eyes. He ate gazing dreamily at the market building opposite. The nearest arched entrance, numbered two, was taking substance as the darkness thinned: a stern stone face, ancient and bearded, stared back at him from over the doorway. Had there ever been a god of carcasses? He had just started on his sausages when Dominic Culpepper arrived. The journalist was almost as tall as Strike but thin, with a choirboy’s complexion. A strange asymmetry, as though somebody had given his face a counterclockwise twist, stopped him being girlishly handsome. “This better be good,” Culpepper said as he sat down, pulled off his gloves and glanced almost suspiciously around the café. “Want some food?” asked Strike through a mouthful of sausage. “Rather wait till you can get a croissant?” asked Strike, grinning. “Well?” demanded Culpepper, with the hot mug in his long pale hands. Strike fished in his overcoat pocket, brought out an envelope and slid it across the table. Culpepper pulled out the contents and began to read. Strike, whose mouth was full of sausage, jabbed a finger at one of the bits of paper, on which an office address was scribbled. “His very (expletive)-off PA,” he said, when he had finally swallowed. “How the hell did you find that out?” asked Culpepper, staring up at Strike over the papers trembling in his excited hands. “Detective work,” said Strike thickly, through another bit of sausage. With a deft movement, Strike tweaked the papers out of the journalist’s fingers. “Yeah, all right,” sighed Culpepper after a moment’s reflection. “Those are kosher. You don’t need to speak to her,” said Strike firmly. The shaking, besotted, bitterly betrayed woman whom he had just left would not be safe left alone with Culpepper. In her savage desire for retribution against a man who had promised her marriage and children she would damage herself and her prospects beyond repair. It had not taken Strike long to gain her trust. She was nearly forty-two; she had thought that she was going to have Lord Parker’s children; now a kind of bloodlust had her in its grip. Strike had sat with her for several hours, listening to the story of her infatuation, watching her pace her sitting room in tears, rock backwards and forwards on her sofa, knuckles to her forehead. Finally she had agreed to this: a betrayal that represented the funeral of all her hopes. “You’re going to leave her out of it,” said Strike, holding the papers firmly in a fist that was nearly twice the size of Culpepper’s. After a moment’s hesitation and with a grimace, Culpepper caved in. The journalist shoved the statements into an inside pocket and gulped his tea, and his momentary disgruntlement at Strike seemed to fade in the glorious prospect of dismantling the reputation of a British peer. “I take it your proprietor’ll get this?” Strike asked, as the bill landed between them. Culpepper threw a ten-pound note down onto the table and the two men left the café together. Strike lit up a cigarette as soon as the door had swung closed behind them. “How did you get her to talk?” Culpepper asked as they set off together through the cold, past the motorbikes and lorries still arriving at and departing the market. Culpepper shot him a sideways glance. “Illegal,” said Strike, blowing smoke into the thinning darkness. They walked fifty yards in silence, Strike’s limp more marked with every step. “This is going to be massive. Massive,” said Culpepper gleefully. Culpepper threw him another sideways look. “See Tom Jones’s son in the paper last week?” he asked. “You haven’t seen my invoice yet,” said Strike. At the top of Long Lane they slowed and turned to face each other. They set off in different directions, Strike heading towards the Tube station. “Looking forward to reading it, Culpepper,” Strike shouted wearily, without turning his head. He limped into the shadowy entrance of the station and was lost to Culpepper’s sight. Nor will not stay! I have business. The Tube was filling up already. Monday-morning faces: sagging, gaunt, braced, resigned. Strike found a seat opposite a puffy-eyed young blonde whose head kept sinking sideways into sleep. Again and again she jerked herself back upright, scanning the blurred signs of the stations frantically in case she had missed her stop. The train rattled and clattered, speeding Strike back towards the meager two and a half rooms under a poorly insulated roof that he called home. In the depths of his tiredness, surrounded by these blank, sheep-like visages, he found himself pondering the accidents that had brought all of them into being. Every birth was, viewed properly, mere chance. With a hundred million sperm swimming blindly through the darkness, the odds against a person becoming themselves were staggering. How many of this Tube-full had been planned, he wondered, light-headed with tiredness. And how many, like him, were accidents? There had been a little girl in his primary school class who had a port-wine stain across her face and Strike had always felt a secret kinship with her, because both of them had carried something indelibly different with them since birth, something that was not their fault. They couldn’t see it, but everybody else could, and had the bad manners to keep mentioning it. The occasional fascination of total strangers, which at five years old he had thought had something to do with his own uniqueness, he eventually realized was because they saw him as no more than a famous singer’s zygote, the incidental evidence of a celebrity’s unfaithful fumble. Strike had only met his biological father twice. It had taken a DNA test to make Jonny Rokeby accept paternity. Dominic Culpepper was a walking distillation of the prurience and presumptions that Strike met on the very rare occasions these days that anybody connected the surly-looking ex-soldier with the aging rock star. Their thoughts leapt at once to trust funds and handsome handouts, to private flights and VIP lounges, to a multimillionaire’s largesse on tap. Agog at the modesty of Strike’s existence and the punishing hours he worked, they asked themselves: what must Strike have done to alienate his father? Was he faking penury to wheedle more money out of Rokeby? What had he done with the millions his mother had surely squeezed out of her rich paramour? And at such times, Strike would think nostalgically of the army, of the anonymity of a career in which your background and your parentage counted for almost nothing beside your ability to do the job. Back in the Special Investigation Branch, the most personal question he had faced on introduction was a request to repeat the odd pair of names with which his extravagantly unconventional mother had saddled him. Traffic was already rolling busily along Charing Cross Road by the time Strike emerged from the Tube. The November dawn was breaking now, gray and halfhearted, full of lingering shadows. He turned into Denmark Street feeling drained and sore, looking forward to the short sleep he might be able to squeeze in before his next client arrived at nine thirty. With a wave at the girl in the guitar shop, with whom he often took cigarette breaks on the street, Strike let himself in through the black outer door beside the 12 Bar Café and began to climb the metal staircase that curled around the broken birdcage lift inside. Up past the graphic designer on the first floor, past his own office with its engraved glass door on the second; up to the third and smallest landing where his home now lay. The previous occupant, manager of the bar downstairs, had moved on to more salubrious quarters and Strike, who had been sleeping in his office for a few months, had leapt at the chance to rent the place, grateful for such an easy solution to the problem of his homelessness. The space under the eaves was small by any standards, and especially for a man of six foot three. He scarcely had room to turn around in the shower; kitchen and living room were uneasily combined and the bedroom was almost entirely filled by the double bed. Some of Strike’s possessions remained boxed up on the landing, in spite of the landlord’s injunction against this. His small windows looked out across rooftops, with Denmark Street far below. The constant throb of the bass from the bar below was muffled to the point that Strike’s own music often obliterated it. Strike’s innate orderliness was manifest throughout: the bed was made, the crockery clean, everything in its place. He needed a shave and shower, but that could wait; after hanging up his overcoat, he set his alarm for nine twenty and stretched out on the bed fully clothed. He fell asleep within seconds and within a few more — or so it seemed — he was awake again. Somebody was knocking on his door. His assistant, a tall young woman with long strawberry-blond hair, looked apologetic as he opened the door, but at the sight of him her expression became appalled. Strike yawned, rubbing his eyes. Six minutes later, in a clean shirt, smelling of toothpaste and deodorant but still unshaven, Strike entered the outer office where Robin was sitting at her computer. Strike saw Robin flush angrily as she turned away, ostensibly organizing the post. There had been something inherently offensive in the way that Baker had said “secretary.” Immaculate in his pinstriped suit, the company director was employing Strike to investigate two of his fellow board members. “No apology?” murmured Baker, his eyes on the ceiling. “Hello, who are you?” Strike asked, ignoring him and addressing instead the slight, middle-aged woman in an old brown overcoat who was perched on the sofa. “Leonora Quine,” she replied, in what sounded, to Strike’s practiced ear, like a West Country accent. “I’ve got a very busy morning ahead, Strike,” said Baker. He walked without invitation into the inner office. When Strike did not follow, he lost a little of his suavity. Strike did not seem to hear him. “What exactly is it you were wanting me to do for you, Mrs. Quine?” he asked the shabby woman on the sofa. “Mr. Strike, I’ve got an appointment in just over an hour,” said William Baker, more loudly. “Strike!” barked William Baker, calling his dog to heel. “Robin,” snarled the exhausted Strike, losing his temper at last. “What?” said William Baker, thrown. He reemerged into the outer office. “He’s sacking you,” said Leonora Quine with satisfaction. The atmosphere in the office seemed to become petrified. Wooden-faced, Robin retrieved Baker’s file from the outer cabinet and handed it to Strike. “He’s finished with you,” interjected Leonora Quine. “Will you shut up, you stupid wom — ” William Baker began, then took a sudden step backwards as Strike took a half-step forwards. Nobody said anything. The ex-serviceman seemed suddenly to be filling twice as much space as he had just seconds before. “Take a seat in my office, Mrs. Quine,” said Strike quietly. “You think she’ll be able to afford you?” sneered a retreating William Baker, his hand now on the door handle. He followed Leonora Quine into his office and closed the door behind him with a snap. Copyright © 2014 by Robert Galbraith Limited. Reprinted with permission of Little, Brown and Company. All rights reserved.